We're so excited! It’s our DECEMBER RELEASE Day at KRAFTIN' KIMMIE STAMPS!! And we’re celebrating with a KRAFTY HOP!! Over the last few days in our Krafty Peeks, we have shared lots of AMAZING new stamps from all our artists for our December release! We’ve got something for everyone!! We’ve got TWO sweet new FAIRYTALE sets featuring our favourite kiddos from Cheryl……ONCE UPON A TIME 1 and 2! And we have a sweet new baby set from Thais Narciso called...... A MOTHER'S LOVE! and also artist Rachelle Anne Miller has an awesome new BOY set of stamps called GREAT ADVENTURES! And we are thrilled to share a SASSY new Moonlight Whispers stamp set....HEY, HOT STUFF! I've one of the fabulous new Moonlight Whispers images from the HEY, HOT STUFF set on my card. Wish I had hair like that! Not only do we have amazing new rubber stamps for all your krafty creations.....but we've made your creating even EASIER with our *exclusive* new KRAFTY KARDMAKING KITS!!! We've designed our DECEMBER KARDMAKING KIT to make your krafty time more enjoyable and less stressful! And we've also got ADD ON packages, in case you want MORE of the goodies found in your kits! You won't believe all the fabby supplies you'll receive! PLUS you get to CHOOSE your FREE stamp to go with the kit! You will get to see ALL of the new images today as you sit back and enjoy our DECEMBER Krafty Hop! As you hop from blog to blog, be sure to leave a comment at each and every stop because some lucky stampers will win packages of these incredible stamps from the new release!! And when you’re done hoppin’, be sure to head over to the Kraftin’Kimmie shop, because ALL the new images are available NOW! OH WAIT!! There's one more thing!!! Santa has stopped by the Kraftin' Kimmie Shop and he's left a special gift for one lucky shopper!!! All orders placed by Monday night at midnight will be in the draw to WIN!! One random shopper will receive......a $50 gift certificate in with their package!!! What a fabulous prize!!! Your card is a masterpiece, every single detail here is perfect and they all make a stunning result. Thank you for your inspiration! 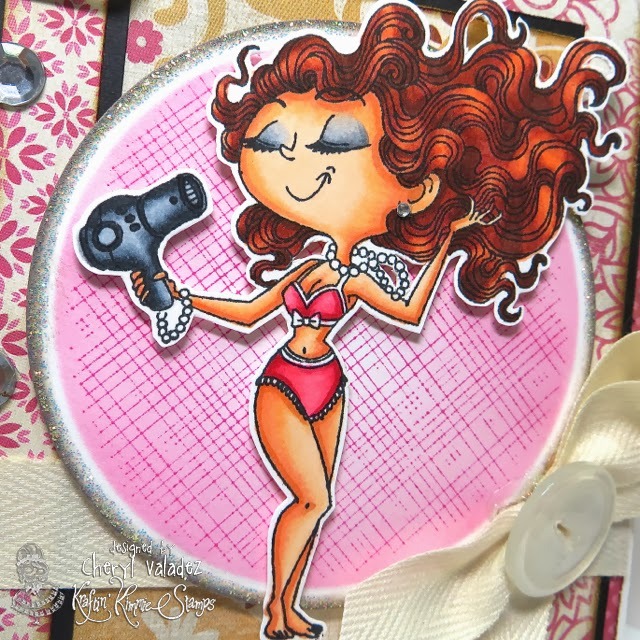 I love this card and fabulous coloring!! Beautiful colouring! Very lovely card. Gorgeous as usual! Love this image as a redhead! Gorgeous card! I love your coloring and color combos. Fab card, Cheryl! I always love your card design and bold colors!